Are you in need of a telemarketing scripting application that can deliver the functionality, flexibility and ease of use you require for even the most complex telemarketing campaigns? TOIS (Telemarketing Online Intelligent System) was developed to allow end users such as call centers or direct marketers to create, manage and track telemarketing scripts and performance. 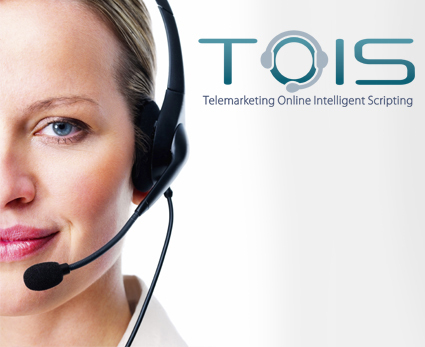 TOIS- Telemarketing Online Intelligent Scripting, is a customer interaction scripting application designed for comprehensive management of inbound and outbound telemarketing campaigns, as well as customer service. It is designed to empower end users to easily create, manage, and edit scripts using simple flowcharts with the integration to MS Visio within shortest time frame requiring the least technical knowledge. It includes functionality to create and manage clients, campaigns, offers, script codes, products, agent groups, media, and sophisticated reporting. TOIS is built on open source technology and can be integrated with exiting hosted or premised based call center technology. TOIS acts as the graphical representation of the actual telemarketing application execution path and screen representations during the call. The call center Admin Module designs the script as flowchart using Script Engine (Windows Application). The Web Application displays controls that dynamically correspond to the controls in the flowchart. The database acts as an intermediate between both the applications. TOIS is available as a standalone product to use with your existing call center technology or as packaged product to include PBX functionality based on your requirements. We work with each of our clients to customize, integrate and install TOIS in any call center environment including premise based and hosted technologies. TOIS is priced on a monthly basis and licenses are purchased per seat, per month. There are minimal upfront costs which include hardware needed to install and use the TOIS application. TOIS is also available on a yearly contract basis or as a purchase option.